New York – The Philippines on Wednesday reaffirmed its commitment to an international agreement that seeks to provide better treatment and protection not only for the more than 10 million Filipinos living and working overseas but for migrants from other countries as well. 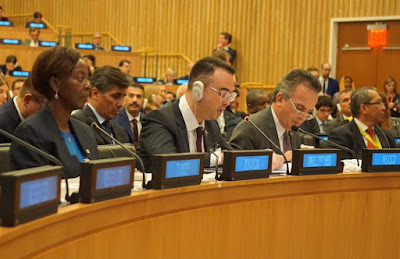 Foreign Affairs Secretary Alan Peter S. Cayetano gave the reaffirmation during a high-level meeting on the Global Compact on Safe, Orderly and Regular Migration that was held on the sides of the 73rd Session of the United Nations General Assembly in New York. “Having millions of migrant Filipinos, we want the Global Compact to be a living document that translates into action, not one that is shelved and cited merely for its aspirations,” Secretary Cayetano said during the meeting that was also participated in by UN Secretary General Antonio Guterres. The Global Compact, which is set for adoption during the Intergovernmental Conference to be held in Morocco in December, seeks to secure the cooperation of the international community in effectively addressing issues related to migration. The Secretary said the hosting by the Philippines last month of the Manila Conference on the Global Compact for Migration underscores the importance the country places on its effective implementation. “The Philippines reaffirms its strong commitment not just to defend and implement the Global Compact, but to promote its implementation by other states,” he said. The Secretary also cited the importance of innovative partnerships, such as the ongoing cooperation between the Philippines and Bahrain. “With the Global Compact as basis, and even in the absence of a bilateral labor agreement or a regional cooperation framework, we are working together on a standard employment contract that would ensure decent work and substantially reduced recruitment cost for hiring Filipino domestic workers in Bahrain,” the Secretary said. He said Manila and Manama are also working together to provide regular pathways to over a thousand Filipino migrant workers through Bahrain’s flexi visa system. “This Philippines-Bahrain cooperation is the best example that the Global Compact is a framework that works on the ground despite its non-legally binding nature,” Secretary Cayetano pointed out. In the statement he read during the meeting, Secretary General Guterres likewise urged member-states to commit themselves to the Global Compact. "I urge governments, businesses, civil society, but also local and regional authorities to come to the table ready to make commitments that will maximize the benefits of well-managed migration, and reduce the negative impact of ill-advised policies and a lack of cooperation," he said. The side event was organized by the Office of the Special Representative of the Secretary General for International Migration Louis Arbour and co-sponsored by the Philippines, Morocco, Mexico, Bahrain, Canada, Rwanda, Turkey, and Brazil. Among those who delivered statements other than the the representatives of the sponsoring countries were the President of the Swiss Confederation and the Foreign Ministers of Denmark, Finland, Tuvalu, Tunisia, and Indonesia.